Mister Enigma got wind of our debunking video Speedebunking Mister UFO: CGI Don’t Think So. At first, he was appreciative. So I guess this is a win/win. Mister Enigma is exposed as a hoaxer, and it only increases his traffic. Sadly, this is not surprising based on the popularity of most hoax channels. Truly odd how you state that I “think” your video is CGI even though I’ve just proved it beyond a shadow of a doubt. Nobody tries to “make a name” for themselves in UFOlogy; if they do, they’re doing it wrong. People simply look for answers in pursuit of the truth. I’m not sure what “hard work” you’re referring to. If your interpretation of hard work is making hoax UFO videos, or reposting videos that others have made, allow me to familiarize you with what “hard work” means: having an extraordinary experience you can’t explain and ruminating about it for decades. Earning the money for cameras and telescopes and IR equipment, then searching the skies for hours in hopes of capturing something amazing with no guarantee of success. Taking up mental bandwidth researching and parsing and trying to make sense of all the disinformation and opinions being pushed at you. That is hard work. All you do is make noise, perpetrate lies, and I presume make money off those lies. Is it even worth it, knowing you’re producing nothing of value? This isn’t about what you’ve done to me, it’s what you to all of us who care about this subject. When you pollute it with false sightings, you help make it even more difficult for a marginalized community to make a difference in the world. If you’ve truly made a mistake and innocently posted a video you didn’t know was fake, allow me to offer my services. I’d be happy to vet any video that comes your way and let you know if it’s authentic. My own original idea for a Youtube program was to expose hoaxes, explore ideas, and make it entertaining. As far as I know that’s rather unique. You know what’s hack and unoriginal and overdone? Taking advantage of people who are looking for answers so you can make a buck. I hope you make better choices in the future. You know what’s coming next, don’t you, folks? Of course you do. 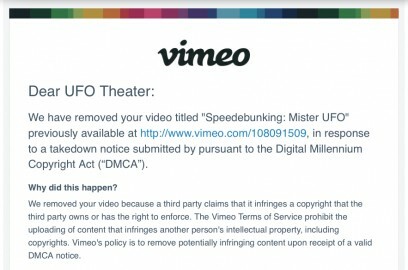 Speedebunking: Mister UFO will be back up after we get copyright clearance, just like we did with the other three videos that were taken down due to the same kind of complaint. Round and round we go.